이이 수고본 격몽요결(李珥 手稿本 擊蒙要訣)은 율곡 이이(1536∼1584)선생이 42세 때인 선조 10년(1577) 관직을 떠나 해주에 있을 때 처음 글을 배우는 아동의 입문교재로 쓰기 위해 저술한 것이다. 이이는 조선 중기의 학자이자 정치가로, 23세 때 별시에서 장원을 한 후 벼슬길에 올랐고, 호조좌랑, 예조좌랑, 우부승지를 거쳐 47세 때 이조판서에 임명되었다. 이이의 성리학 사상은 근대에 이르기까지 역사전개에 커다란 영향을 미쳤으며, 이외에도 를 세우고 십만양병설을 주장했다. 그가 죽은 후 전국 20여개 서원에 위패가 모셔졌으며, 시호는 문성이다. 저서로는 『격몽요결』 외에 『성학집요』, 『기자실기』, 『만언봉사』 등이 있다. 이 책은 율곡이 직접 쓴 친필 원본으로 한지에 행서체로 단아하게 썼으며, 내용은 제1장 에서부터 의 항목으로 나누어 제10장으로 구성하여 서술하였다. 특히 이 책머리에는, 정조 12년(1788)에 이 책을 친히 열람하고 제목에 글을 지어 문신 이병모(1742∼1806)에게 명해 이를 책머리에 붙이게 하였다. 『격몽요결』은 조선 중기이후 일반에게 널리 보급되어『동몽선습』과 함께 초학자의 입문서로 근세에까지 많이 읽혀져 왔다. 더욱이 이『격몽요결』은 여러차례 목판본이나 활자본으로 출간되어 왔으나, 유일한 친필본은 율곡의 이모가 시집간 권씨집안에 율곡의 유품과 함께 대대로 소장되어 왔으며, 이것은 율곡이 친히 쓴 친필원본으로 그 가치가 크다고 평가된다. Gyeongmong yogyeol (The Secret of Expelling Ignorance) was written in 1577 (the 10th year of King Seonjo’s reign) when Yi I was forty-two years of age and was staying in Haeju, retired from his government office. The book was written as a textbook for initiating youth to learning. Yi I was a scholar and a statesman of mid-Joseon. After passing the special session of the civil service examination at the age of twenty-three, he served successively as the Hojo jwarang, Yejo jwarang and Ubu seungji, with his career culminating in his appointment as the Ijo panseo (minister of the Board of Personnel) at the age of forty-seven. His Neo-Confucian thinking had a tremendous influence on the course of Joseon’s history. He proposed to the king a series of reforms through his ‘Simuyukjo’ and asked to expand the army. After his death, his memorial tablets were placed in twenty Confucian shrine-academies across the country. His posthumous title is Munseong, and his works include Seonghakjibyo (Essentials of the Learning of the Sage), Gijasilgi (The True Story of Jizi) and Maneonbongsa (Memorials in Ten Thousand Words) in addition to Geongmongyogyeol. 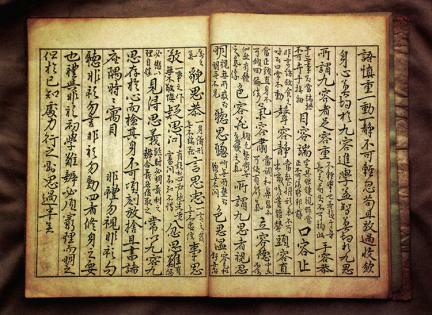 This manuscript is the original written in Yi I’s own hand. 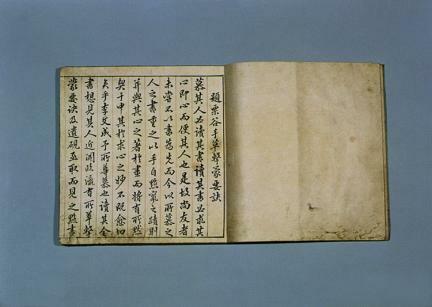 The manuscript is elegantly written in semicursive characters on Korean mulberry paper. The contents are divided into several sections, from ‘Ipji (Setting the Goals)’ to ‘Cheose (Social Life)’ in this ten-sheet book. In 1788 (the 12th year of King Jeongjo’s reign), the book was read by the king who, then, wrote a preface for it and had an official -Yi Byeong-mo (1742-1806) - attach the text to its head. Gyeongmong yogyeol was widely circulated among common people since mid-Joseon and was read extensively as a primer, along with Dongmongseonseup (First Lessons for the Young and Unenlightened), until the turn of the 19th century. Gyeongmong yogyeol was printed several times using woodblocks or movable types. 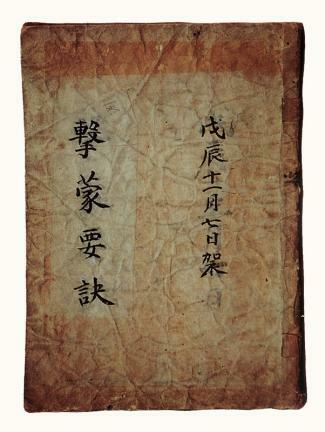 This autograph in Yi I’s handwriting was passed down in the family of an aunt of his, along with other personal artifacts. This autograph is considered of an inestimable value.